I know Scot Kelby is a well known Photoshop writer trainer and and also evangelist, but he is also a well known photographer and photography writer (Wikipedia says for 2010-2012 he was the #1 best selling photography writer) and the organizer of the popular Worldwide Photo Walk, so I was surprised, but not shocked, when registering to this year's photowalk I saw this question in the registering form: I answered "None of the above" when asked which software I use to edit photos, as I use mainly GIMP and there is nothing close to it (only Photoshops, iStuff, bundled stuff and online stuff are available choices) as there is no one of the any other FOSS options (darktable, DigiKam, to name a couple). Still, no need to get paranoid, there aren't listed none of the many (and crappy) smaller proprietary editing tools, even if they are used by a lot of people. 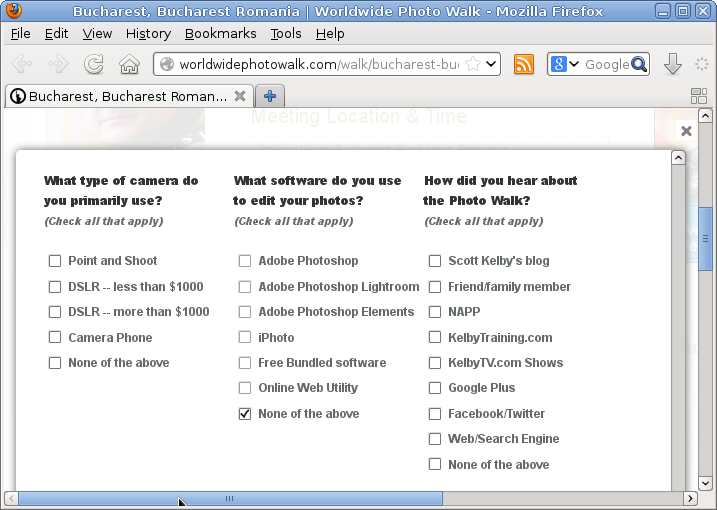 I know some of the people participating in the Bucharest photowalk and most of them are in the "None of the above" category (still, they are neither in the "FOSS" category).